High-end amenities abound at the Harbor Beach Marriott Resort & Spa in Fort Lauderdale, Florida, which earlier this year completed a $50 million renovation. Players in the National Football League Pro Bowl were among the first guests following the renovation. For meeting professionals, the resort increased indoor meeting space to 48,000 square feet, doubled the size of the fitness center, and offers more than 100,000 square feet of indoor and outdoor meeting space, some overlooking its private beach. 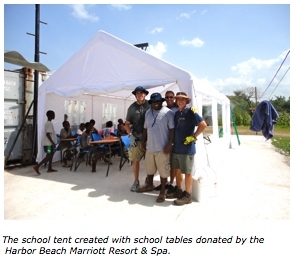 But these luxuries and big spaces were far from the minds of the hotel’s executives when six of them plus two Haitian employees traveled to Haiti this past August to help the Haitian people recover from the recent devastating earthquake. We caught up with Director of Sales and Marketing Jay Marsella and asked him about the trip. What prompted you to go to Haiti? We employ over 250 Haitian associates, and all were affected by the tragedy. Some lost entire families to the earthquake. It is part of Marriott’s culture to take care of our associates, and as a team, we felt this was an investment more important than any teambuilding we could do. We wanted to make a difference in some way, and decided what better way than to open up our hearts to a place that not only needed it, but is connected to us personally through our associates. Who went along on the trip? Six of us, including our General Manager. We also took two Haitian hourly associates from human resources and our laundry department. Our human resources associate, who is 30 years old, was reunited with his mother after more than 20 years. A truly special moment. We went on a trip to support the Great Commission Alliance www.gcanet.org whose work there focuses on the people that need it most. The focus was on education and supporting orphanages. Basically, the future of Haiti lies with the youth there and they need support to feed and educate them. We assisted in the distribution of food and clothing to many families and orphans, assisted building a home of a widowed mother of two girls, donated classroom-style chairs, built a canopy school, and anything else we could do. 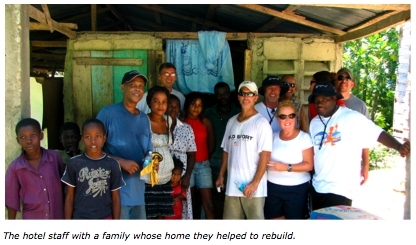 How did the trip help your executive team in addition to the help you provided to the people of Haiti? It was the ultimate teambuilding event for us. It was an emotional trip and each of us were very much touched by the experience. We saw personal sides of each other that you would never see at a typical “retreat.” We were housed in small rooms with bunk beds for six people and shared a bathroom with an additional six people. Far from staying at our luxury brands! There was no housekeeping, air conditioning was hit or miss, we were always on guard to avoid any type of sickness, and food was prepared in conditions that were far from the comforts of home. We learned about the people of Haiti and a great deal about ourselves and each other. It was one of the most rewarding trips we have ever made. What was the most challenging part of the trip and the work you did? Two things come to mind. First, trying to stay somewhat emotionally unattached when you are helping kids who are hungry and sick – some are visibly malnourished. It is definitely sad to see what we saw. Second was the heat – we worked all day and even though we are from south Florida, it was pretty hot and humid. What surprised you the most about Haiti? The spirit of the people. After all the devastation, they were happy, friendly, faithful, and welcoming. This entry was posted in Charitable Connections and tagged Florida meetings, Marriott, team building activities on October 28, 2010 by ConventionPlanit.com. Our next meeting offers a raffle of concert tickets, a free weekend getaway at a luxury resort, and gift cards for local restaurants, with proceeds benefiting The Leukemia & Lymphoma Society. When people hear that your meeting benefits a cause – and could potentially benefit them (A free vacation! A free concert!) – they sign on and show up in droves, with wallets ready and a renewed interest in your group. You’ve transformed your meeting from All-Business into an Evening That Gives Back. Even in this downward spiral economy, people still want to give…and perhaps moreso, they want to win. And local charities want you to bring them on board, promote them to your audience and your mailing list, and devote their workforce to the success of your event. Everybody wins. So how do you start the process of adding a charitable twist to your meetings? First, appoint a chairperson to the event. Who has the time to find and check out local charities? Who has the organizational skills to pull together a successful event? Assigning a lead person takes the mountain of work off of you and gives them a little something for their resume, as an added perk. It’s that person’s choice as to whether or not to assemble a team of volunteers for mailings, menu planning, recording of prizes, and general event-planning. Your team knows the drill. The focus now is on finding the perfect charity to bring on board. You might have a favorite charity of your own, and you can connect with their local branch – as found through their website – to inform them of your planned event. In many cases, they offer to activate their volunteers and PR department to promote your meeting in your community. They may even have a list of donors who will be happy to send in prizes for your raffle. One well-connected volunteer sent over playoff tickets for an NFL team, and the most popular raffle item of the night was a pet hamster donated by a local pet store. The group raised over $25,000 for a cancer charity, and regular meeting attendees’ word-of-mouth recommendation soon increased attendance at future events, both charity and non-charity. If you do not have a favorite charity, or if your group brainstorms several local causes as potential beneficiaries of your event, it’s vitally important for you to check out the contenders – and perhaps discover additional local charities that would be great matches for your event – at the following websites: www.networkforgood.org, www.charitablechoices.org, and www.givespot.com. You have to make sure that charities are legitimate, registered with the state, licensed and that you’re happy with the percentage of donations that goes to the actual cause, rather than to administrative fees. Checking out a charity involves a lot of legwork, so research well and pick your best partner. Next is finding a theme for your meeting. Check out www.calendarzone.com and www.dailycelebrations.com to find a surprising, little-known, holiday that would be the perfect tie-in to your event. October is breast cancer awareness month, so your meeting could connect with that cause, bringing in local businesses offering their products and services as raffle items for the Susan G. Komen Foundation, for instance. Or, getting more creative, July is National Ice Cream Month, so your meeting could include local vendors offering free ice cream sundaes to meeting attendants, and prizes such as a free child’s ice cream party or a local home décor store offering free dessert bowl sets as raffle prizes to benefit your chosen cause. The key is planning a creative theme that meeting attendees haven’t experienced a hundred times before, such as wine and cheese nights. Could you connect with a tapas restaurant for a more gourmet menu? Or a local dance academy to bring in their upper echelon dancers to demonstrate salsa and pasa doble performances as the evening’s entertainment, raffling off private lessons or classes to benefit your cause? What’s hot in pop culture that inspires a motivating, attractive meeting theme? One of the most popular charitable event themes is relaxing, so spa and pampering businesses could come in to offer chair massages and aromatherapy treatments to your attendees, raffling off their services for your cause. Juice bars can provide healthy smoothies gratis, and organic markets can donate healthy menu items – all with gift cards to their establishment as prizes. If you’d rather play down the party aspect of your charitable-connection meeting, you may be able to find winning donations right through the site of your meeting. Omni Hotels (www.omnihotels.com), for instance, offers a program in which your group earns rewards points or mileage for the number of rooms booked by your meeting attendees. These reward or mileage points can then be offered as a raffle prize for your cause. A meeting attendee, arriving with clipboard, ready to learn, may be thrilled to win a free stay at any Omni Hotel worldwide, a spa package, a round of golf, or airline miles making that wished-for second honeymoon possible. This rewards system for meeting planners is springing up throughout the resorts industry, so check for Meeting Planner Benefits during your site booking phase, and don’t be afraid to ask for a percentage of your group’s booking proceeds to be kicked back to you for your charity raffle. This is the kind of opportunity that hotels and resorts love to promote about themselves as well, and you might just inspire a new Rewards plan at that establishment to benefit other groups, perhaps your own for future return visits. Talk about a win-win! Benevolence may be its own reward, but pairing charitable efforts with your meetings is a surefire way to ‘give back’ while expanding your circle of contacts and promoting your group in your community. Sharon Naylor is the author of 35 special event and wedding books. For more information about Sharon, please visitwww.sharonnaylor.net. This entry was posted in Charitable Connections and tagged charity meetings on August 30, 2009 by ConventionPlanit.com.